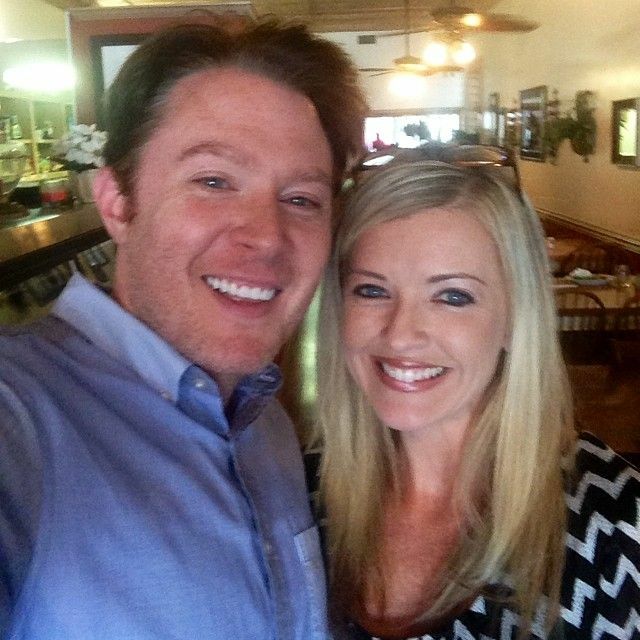 On Thursday, July 17, Clay Aiken visited Randolph County, North Carolina. He spent most of the day in Asheboro, the county seat. 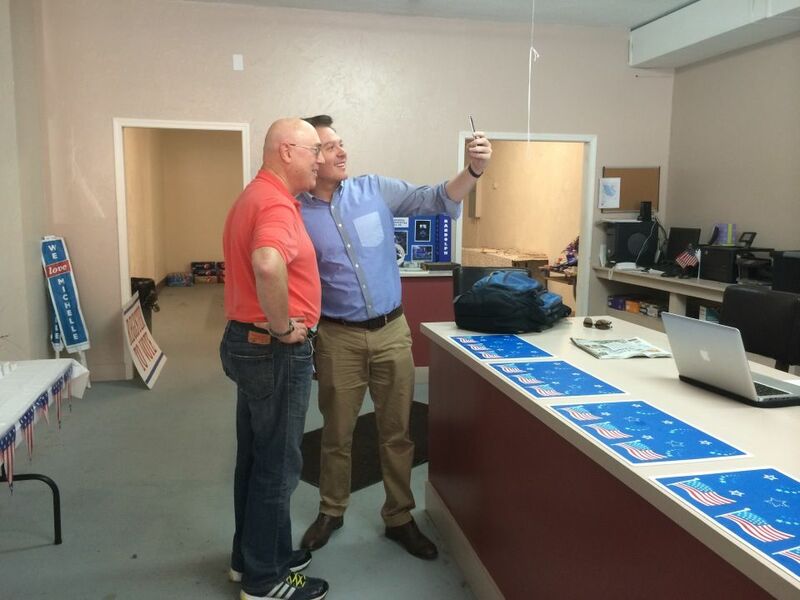 Clay even took some of his famous “selfies” when he was at the democratic headquarters. Clay visited the new democratic headquarters. Some local visitors stopped by to meet and chat with him. At lunchtime, Clay, Ebonie, and some of the workers at the headquarters walked down the street to Magnolia 23. This restaurant is known for its fresh, home-grown food and specializes in southern food. After lunch, Clay had the opportunity to talk with reporters from the local newspaper. Then, he headed over to Randolph Hospital for a visit. It sounds like Clay had a busy but fun day in Randolph County. 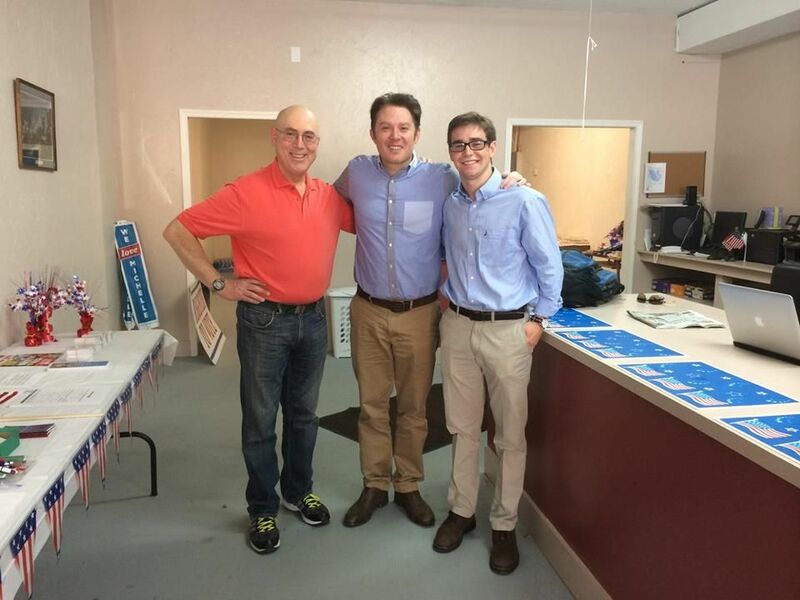 Congressional District 2 candidate Clay Aiken is becoming a familiar face in Randolph County with another visit to Asheboro’s downtown area and the Randolph County Democratic Headquarters on Church Street Thursday. Aiken is the Democratic challenger to incumbent Republican U.S. Rep. Renee Ellmers whom he will face in the Nov. 5 General Election. Aiken beat Asheboro businessman Keith Crisco, now deceased, for the Democratic slot in a narrow May 6 primary that resulted in a recount. Aiken said in an interview Thursday that he is more comfortable now that the primary has passed. He said during the primary he always tried to be respectful of Crisco when he came to Crisco’s hometown. He said he felt Crisco took the same approach toward him when campaigning in Wake County. Aiken said primaries have a way of pitting people against one another who don’t always have a difference of opinion on the issues – just different strategies on how to approach problems. Now that the primary is over, he is free to focus his attention on the differences he can offer voters over Ellmers. Aiken said it is no secret that Ellmers is vulnerable. He said people tell him frequently that she has not been visible in her own district. Aiken said that should have been her main concern during the last four years she has been in office. Instead, he said, she has been focused on courting the Republican leadership in Washington for her own benefit. Coble represented Randolph County in District 6 until after redistricting in 2000. At that time, district lines were redrawn, putting Randolph County in District 2. Some contend the lines were drawn to benefit Ellmers and others like her, to ensure she could be re-elected. … As he talks with voters about these and other issues, Aiken said he is asking people two things. First, what has Ellmers done for you in the four years she has been in office? Then he asks voters to give him a chance. “If, in 2016, I have not done any more for you than she has done in four years, vote me out,” he said. 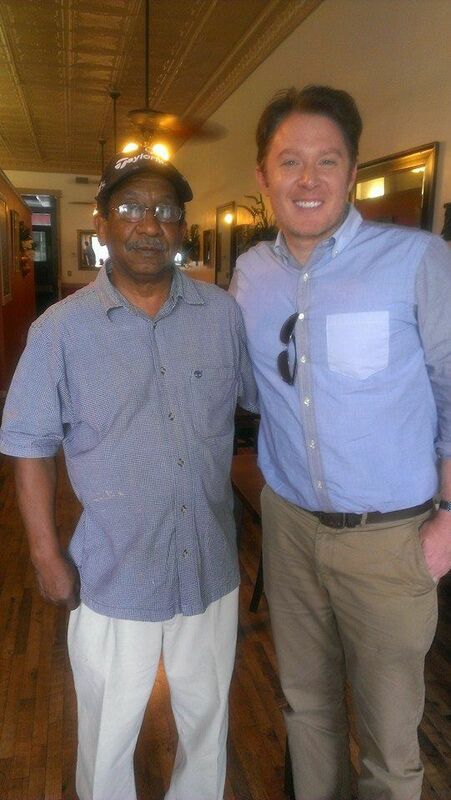 I enjoy reading about Clay’s visits to the many communities in the 2nd district. I do believe that when Clay has the opportunity to meet people and chat with them, they will want to support him. He is knowledgable, articulate and hard-working…and when you talk to him, he looks right at you and listens to every word. These are all important assets. I also enjoy learning more about North Carolina. Did you know that Randolph County is home to the natural habitat North Carolina Zoo, the Uwharrie National Forest, and the Richard Petty Museum? It is also home to the Seagrove potteries which enjoy an international reputation for exceptional hand-thrown pottery. All of this added to the wonderful food at Magnolia 23 makes me want to spend some time in Randolph County. As always, I will post important news of Clay and his campaign when it becomes available. Please check for any up-dates! Love seeing Clay out and about in his district. Thanks Musicfan for bringing all of this over….Love to catch up on things in one area. Been so busy lately, I can't keep up. Oooh, I did go and read the whole article! He sure knows what he is talking about! I love it! Clay for Congress!! The Courier Tribune article was well done. Clay always has the correct response to a question. Nothing seems too difficult to address. He seems to be so in control of things. He looks happy, relaxed and well informed. I'm so proud of him and his team. Clay for NC!!! Error: Error validating access token: Session has expired on Tuesday, 21-Aug-18 16:13:01 PDT. The current time is Sunday, 21-Apr-19 22:32:27 PDT.